Episode #45 Timecapsule: Aside from hosting a single low-level quest and providing an inexpensive way to travel between Ironforge and Stormwind, the Deeprun Tram is also home to a few rarely seen creatures. In the subterranean-lake portion of the tunnel, the water hides a Naga Siren, a Basking Shark, a gnomish Deeprun Diver, and a sunken treasure chest. 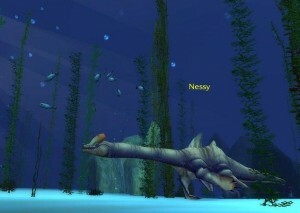 Yet, the most elusive resident is Nessy – the boss-level Thesher sea monster. Nessy, a clear reference to the famous creature of Loch Ness, lives a secretive life. Here in Azeroth, Nessy happily hides deep in the watery depths of the Deeprun Tram, waiting to be discovered by a brave explorer!